Food allergies are caused by an abnormal immune response to ingested antigens. They manifest as urticaria, nausea, vomiting, abdominal pain, or anaphylaxis, usually within a short period after consumption of the relevant food, and can be either IgE-dependent or IgE-independent. They affect large numbers of people, particularly children in industrialized countries, and represent an important and increasing public health problem. The pathogenesis of food allergy involves a failure of the mechanisms that normally prevent or control immune reactivity to orally administered antigens. Treatment strategies include avoidance of the offending dietary component, control of symptoms with the appropriate pharmacologic agents, and immunologic approaches directed at restoring nonresponsiveness to the relevant allergen. 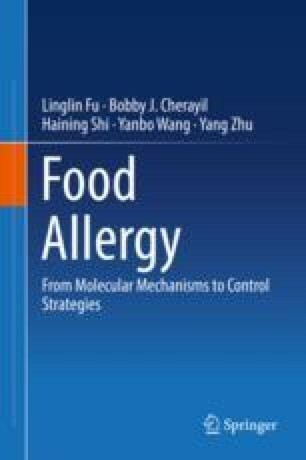 This chapter will review current concepts in the immunology and treatment of food allergy.